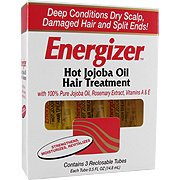 Energizer Hot Jojoba Oil Hair Treatment strengthens, moisturizes and revitalizes dry hair. Contains 100% pure jojaba oil, rosemary extract and vitamins A & E. Deep conditions dry scalp, damaged hair and split ends! Strengthen, moisturizes, revitalizes. Contains 3 reclosable tubes. Jojoba Oil has been used for centuries as a deep moisturizer for hair and scalp. Energizer Hot Jojoba Oil Hair Treatment opens up the hair cuticle to lightly coat each imbrications on the hair shaft and penetrates the sebum build-up on the scalp to moisturize the follicle openings in the dermal layer. Rosemary extract provides a volatile oil stimulant that draws blood circulation to the scalp and hair follicles, thus strengthening and revitalizing the hair. Vitamins A and E nourish each strand of fine, dry, brittle or over-processed hair with antioxidant protection. Pure Jojoba Oil 100%, Rosemary Extract, Vitamin A, Vitamin E.
Energizer Hot Jojoba Oil Hair Treatment is shipped in a discrete, unmarked package. Orders are processed immediately and usually take about 3 to 5 working days to be received. We do ask that you try it for 2 to 3 weeks to feel the full effects. Any information received is used only for order processing and shipping purposes. Your information, such as e-mail address, will never be disclosed to a third party.